Murad Vitamin C Moisturizer - Vitamin C has many benefits to our health and our skin. Vitmain C is a very critical component for the making of collagen. What would our face look like without collagen? It would be saggy and look very dull. Yuck!!!! You can pass me the vitamin c please. All in all Vitmain C in facial products hep reduce wrinkles and improve the quality of our skin. Murad has come out with 2 vitamin c moisturizers to improve our skin. This Murad Vitamin C moisturizer is a fantastic anti-aging moisturizer that contains 2 water-soluble forms of vitamin c. It protects against skin damage and firms the face and neck. 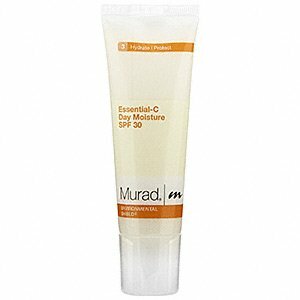 Who Can use It?This Murad vitamin c moisturizer is suitable for all skin types. How To Use After cleansing and toning, apply all over face and neck. I will even apply it on my chest for extra sun protection. Ingredients: Water (Aqua), Butylene Glycol, Stearic Acid, Cocoglycerides, Diisopropyl Sebacate, Glyceryl Stearate, Lauryl Lactate, PEG-100 Stearate, Isodecyl Neopentanoate, Dimethicone, Cetyl Alcohol, Aminomethyl Propanol, Pelvetia Canaliculata Extract, Ectoin, Ginkgo Biloba Leaf Extract, Vitis Vinifera (Grape) Seed Extract, Passiflora Incarnata Extract, Tetrahexyldecyl Ascorbate, Sodium PCA, Panthenol, Tripleurospermum Maritima Extract, Sodium Myristoyl Sarcosinate, Tocopheryl Acetate, Phospholipids, Retinyl Palmitate, Ascorbyl Palmitate, Chitosan Ascorbate, Betaine, Sorbitol, Glycine, Alanine, Proline, Serine, Threonine, Arginine, Lysine, Glutamic Acid, Zinc Gluconate, Ethyl Linoleate, Cetyl Phosphate, Magnesium Aluminum Silicate, Xanthan Gum, Disodium EDTA, Phenoxyethanol, Caprylyl Glycol, Chlorphenesin, Eugenol, Limonene, Linalool, Fragrance (Parfum), Yellow 6 (CI 15985), Red 33 (CI 17200). "I love the smell and that it protects my skin from the sun." "I'm naturally oily but this works great." "This moisturizer has changed my skin. I will never change." "A good winter moisturizer, but too much for the summer months." "Does not blend into the skin easily." This Murad vitamin c moisturizer hydrates, repairs, and rejuvenates skin while you are asleep. It promotes collagen production to hep with skin's elasticity. A key ingredient is Vitamin C. It also contains Vitamin A and Shea Butter. Who Can use It? Is suitable for all skin types. How To Use After cleansing and toning, apply all over face and neck. Ingredients:Water (Aqua), Cetearyl Ethylhexanoate, Ethylhexyl Hydroxystearate, Stearic Acid, Cetearyl Alcohol, Butylene Glycol, Glyceryl Stearate, PEG-100 Stearate, DEA-Cetyl Phosphate, Polysorbate 60, Chitosan Ascorbate, Lysine Lauroyl Methionate, Rice Amino Acids, Zinc Aspartate, Phospholipids, Tocopheryl Acetate, Retinyl Palmitate, Ascorbyl Palmitate, Phytonadione, Ethyl Linoleate, Panthenol, Dimethicone, Ginkgo Biloba Extract, Vitis Vinifera (Grape) Seed Extract, Passiflora Incarnata Flower Extract, Hydrolyzed Ulva Lactuca Extract, Enteromorpha Compressa Extract, Butyrospermum Parkii (Shea Butter) Fruit, Sodium PCA, Isostearic Acid, Glycerin, Carbomer Disodium EDTA, Triethanolamine, Phenoxyethanol, Methylparaben, Propylparaben, Citrus Grandis (Grapefruit) Peel Oil, Citrus Aurantium Dulcis (Orange) Oil, Aniba Rosaeodora (Rosewood) Wood Oil, Geranium Maculatum Oil, Lavandula Angustifolia (Lavender) Oil, Thymus Vulgaris (Thyme) Oil, Yellow 6 (CI 15985). "Leaves my skin nice and dewy when I wake up." "Has really firmed my skin." "It moisturizes really well and does not break me out." "I wasn't crazy about the smell, it has worked ok for me." "I have snesitive and dry skina nd this product has worked wonders."